From The Wall Street Journal, on the general lack of effectiveness of Porkulus Packages. If you say that stimuly spending saved us from a meltdown, you're looking at is as a theologian. It's a matter of faith for you, nothing more. Logic and evidence don't interfere with your worldview. Policy makers in Washington and other capitals around the world are debating whether to implement another round of stimulus spending to combat high unemployment and sputtering growth rates. But before they leap, they should take a good hard look at how that worked the first time around. 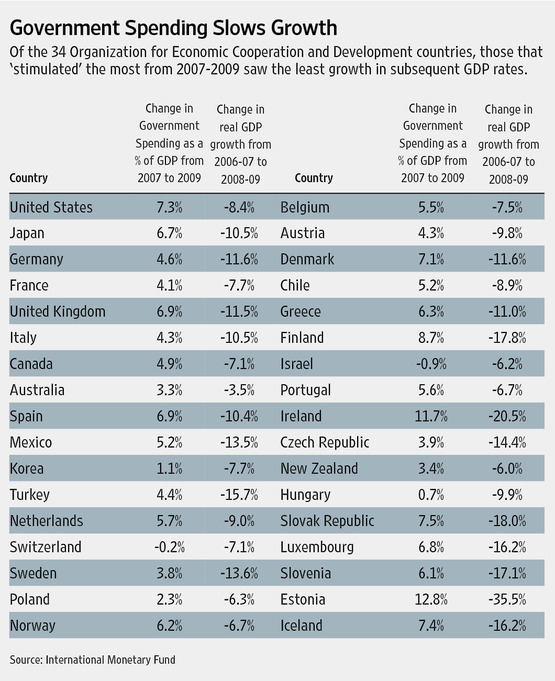 It worked miserably, as indicated by the table nearby, which shows increases in government spending from 2007 to 2009 and subsequent changes in GDP growth rates. Of the 34 Organization for Economic Cooperation and Development nations, those with the largest spending spurts from 2007 to 2009 saw the least growth in GDP rates before and after the stimulus. The four nations—Estonia, Ireland, the Slovak Republic and Finland—with the biggest stimulus programs had the steepest declines in growth. The United States was no different, with greater spending (up 7.3%) followed by far lower growth rates (down 8.4%). Close..Still, the debate rages between those who espouse stimulus spending as a remedy for our weak economy and those who argue it is the cause of our current malaise. The numbers at stake aren't small. Federal government spending as a share of GDP rose to a high of 27.3% in 2009 from 21.4% in late 2007. This increase is virtually all stimulus spending, including add-ons to the agricultural and housing bills in 2007, the $600 per capita tax rebate in 2008, the TARP and Fannie Mae and Freddie Mac bailouts, "cash for clunkers," additional mortgage relief subsidies and, of course, President Obama's $860 billion stimulus plan that promised to deliver unemployment rates below 6% by now. Stimulus spending over the past five years totaled more than $4 trillion. Hit the link at the top to read the whole thing before it disappears behind a pay wall. Hit a Statist upside the head with this chart next time he or she says the stimulus wasn't big enough.